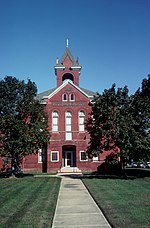 Accomack County is a United States county located in the eastern edge of the Commonwealth of Virginia. Together, Accomack and Northampton counties make up the Eastern Shore of Virginia, which in turn is part of the Delmarva Peninsula, bordered by the Chesapeake Bay and the Atlantic Ocean. The Accomack county seat is the town of Accomac. The Eastern Shore of Virginia was known as "Accomac Shire," until it was renamed Northampton County in 1642. 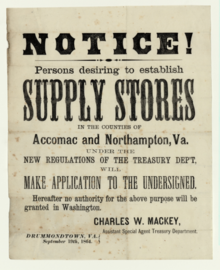 The present Accomack County was created from Northampton County in 1663. The county and the original shire were named for the Accawmack Indians, who resided in the area when the English first explored it in 1603. As of the 2010 census, the total population was 33,164 people. The population of Accomack has remained relatively stable over the last century, though Accomack is one of the poorest parts of Virginia. Members of an English voyage of exploration landed in the area in 1603, four years before the founding of the Jamestown Colony. Captain John Smith visited the region in 1608. The Accawmacke nation at the time numbered around 2000, and were governed by Debedeavon, a paramount chief called by the English the "Laughing King". He became a staunch ally of the English newcomers, granting them several large areas for their own use. Accomac Shire was established in 1634 as one of the eight original shires of Virginia. The name comes from the native word Accawmack, which meant "on the other side". In 1642 the name was changed to Northampton, following a policy of eliminating "heathen names". Northampton was divided into two counties in 1663. The northern adopted the original name, while the south remained Northampton. In 1940, the General Assembly officially added a "k" to the end of the county's name to arrive at its current spelling. The name of "Accomack County" first appeared in the Decisions of the United States Board on Geographical Names in 1943. In 1670, the Virginia Colony's Royal Governor William Berkeley abolished Accomac County, but the Virginia General Assembly re-created it in 1671. According to the U.S. Census Bureau, the county has a total area of 1,310 square miles (3,400 km2), of which 450 square miles (1,200 km2) is land and 861 square miles (2,230 km2) (65.7%) is water. It is the largest county in Virginia by total area. The state of Delaware is roughly 36 miles (58 km) away from the Virginia and Maryland state-line in Greenbackville. As of the census of 2010, there were 33,164 people, 15,299 households, and 10,388 families residing in the county. The population density was 84 people per square mile (32/km²). There were 19,550 housing units at an average density of 43 per square mile (17/km²). The racial makeup of the county was 65.3% White, 28.1% Black or African American, 0.4% Native American, 0.6% Asian, 0.1% Pacific Islander, 3.9% from other races, and 1.6% from two or more races. 8.6% of the population were Hispanic or Latino of any race. Black or African American (28%), English American (15%), German (9%), Irish (9%) and Mexican (4%). There were 15,299 households out of which 28.90% had children under the age of 18 living with them, 49.20% were married couples living together, 14.40% had a female householder with no husband present, and 32.10% were non-families. 27.70% of all households were made up of individuals and 12.50% had someone living alone who was 65 years of age or older. The average household size was 2.45 and the average family size was 2.96. In the county, the population was spread out with 24.30% under the age of 18, 8.20% from 18 to 24, 26.20% from 25 to 44, 24.70% from 45 to 64, and 16.70% who were 65 years of age or older. The median age was 39 years. For every 100 females there were 94.30 males. For every 100 females age 18 and over, there were 90.00 males. Accomack and adjacent Northampton County are the two poorest counties in the Commonwealth of Virginia. Accomack County is represented by Democrat Lynwood W. Lewis, Jr. in the Virginia Senate, Republican Robert Bloxom in the Virginia House of Delegates, and Democrat Elaine Luria in the U.S. House of Representatives. The county is served by Accomack County Public Schools. Eastern Shore Community College is located in Melfa. The county maintains and is the licensee of six television translator stations on two towers, with four located on a tower off US 13 in unincorporated Mappsville licensed to Onancock, and the other two licensed to unincorporated Craddockville on a tower near Route 178. Each translator tower has four signals to relay the signals of Hampton Roads's major network affiliates to the county, including WAVY, WHRO, WTKR, and WVEC. Meanwhile, Fox programming via WVBT is provided by WPMC-CA (Channel 36) from the Mappsville tower, a station owned by Media General, the parent company of WAVY/WVBT. Additionally, Salisbury, Maryland CBS / Fox affiliate WBOC-TV has long claimed Accomack County as part of its coverage area. ^ Gannett, Henry (1905). The Origin of Certain Place Names in the United States (PDF). p. 23. ^ Topping, Mary, comp., Approved Place Names in Virginia: An Index to Virginia Names Approved by the United States Board on Geographic Names through 1969 (Charlottesville, VA: University Press of Virginia, 1971), 1. ^ Education, Virginia Department of (2009). "Virginia Public School Division Staff". Virginia Department of Education. Archived from the original on 2011-07-28. Retrieved 2009-12-19. ^ a b c d e f Who Was Who in America, Historical Volume, 1607-1896. Chicago: Marquis Who's Who. 1963. Wikimedia Commons has media related to Accomack County, Virginia.